I love Bath and Body Works. I literally cannot write my love for that shop on this blog enough. If they let me use their items and name for a franchise, I would do. I would sell those hand sanatizers, body mists and candles all day and all night to the best of my ability as I truly believe we are missing out massively in the UK! Anyway. 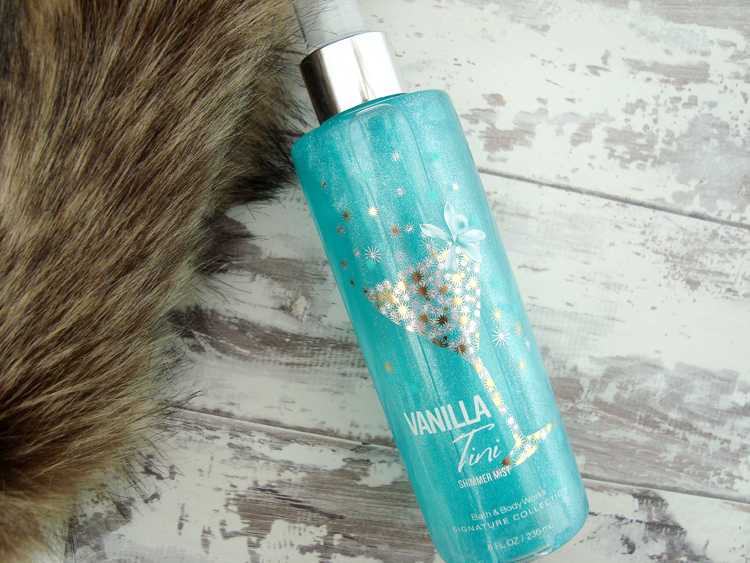 A perk of having my mums best friend living in the US means lovely gifts from Bath and Body Works and for my birthday I received this beauty, the Bath and Body Works Vanillatini Shimmer Mist. It isn't something I am too familiar with and I initially looked at it and thought "well, what is it??" Well, to put it simply, it is a glittery body spray. My younger self would be squealing with delight! Many years ago, we are talking secondary school days, my friend bought me a Ted Baker gift set full of different scents and toiletries. Within the set was two identical packaged items. A body spray and a bronze body shimmer. What did I do? Yep, spray the copper brown shimmery liquid all over my clothes one hectic morning. Since then I have tried to stay clear of glittery, shimmery things for the body but now that I am older, I am ready to give it a try. 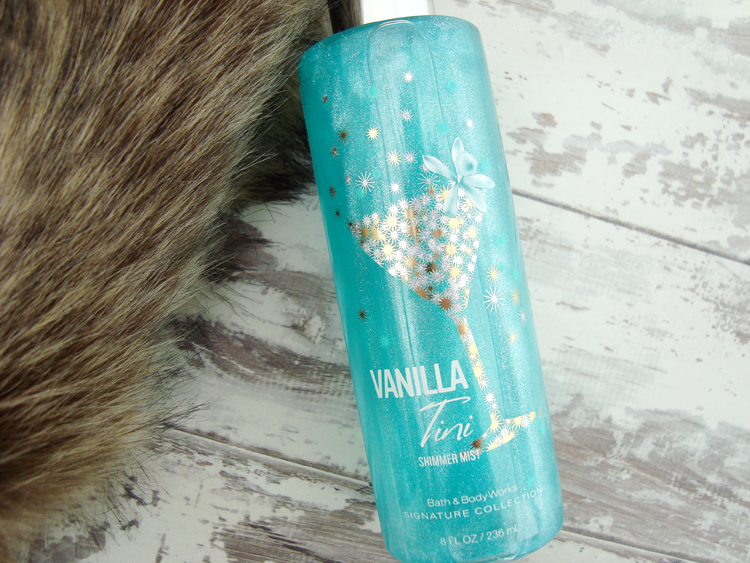 I tried to Google this product before writing this review to find the price and I managed to find out that this Vanillatini Shimmer Mist was first out many years ago until it got discontinued but earlier this year Bath and Body Works bought it back for a limited time only. I think it is a real shame that they discontinued it as it smells absolutely incredible. I expected this to spritz out a blue shade onto the skin but it is completely clear with silver, shimmery particles throughout. The smell... ahh, the smell. If you love coconut then you will love this! If you hate coconut then.. sit this one out. Vanillatini is a concoction of fresh vanilla, creamy coconut and lemon zest, all mixed into one. It smells exotic and fresh without being overpowering or too sweet. It lingers on the skin all day, literally. I could smell it for hours, even after just one spritz to each wrist. I absolutely love it. I love the scent and I like the shimmer but to me, the shimmer doesn't add anything. I don't know why I would want to have glittery arms for. But hey, I am pale and interesting, or so they say. If you have a bit of a tan then maybe you will appreciate the shimmer more than I will but overall, I would purchase this for the scent alone and I would love to be able to track down another bottle! This sounds lovely! I love Bath and Body Works products! I've never been to Bath & Body Works actually! I love the packaging on this though, it's almost Christmassy isn't it? Such a lovely blue and I adore coconut so this would be great for me!